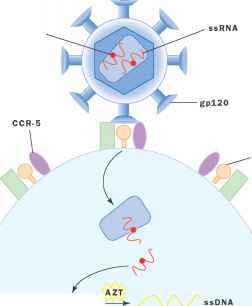 HIV binds to CD4 and CCR-5 or CXCR4 on the surface of the target cell, allowing the virus coat to fuse with the cell membrane and virus contents to enter the cell. (2) Reverse transcriptase (RT) enzyme transcribes viral RNA into singlestrand viral DNA, a step blocked by RT inhibitors (AZT, ddi, d4t, ddc). Single-strand DNA is converted to double-strand DNA which then enters the nucleus and integrates into the host chromosome. 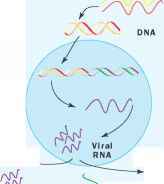 (3) Upon activation of the cell, viral RNA triggers manufacture of viral proteins. In the absence of protease inhibitors, proteins are processed into shorter lengths. 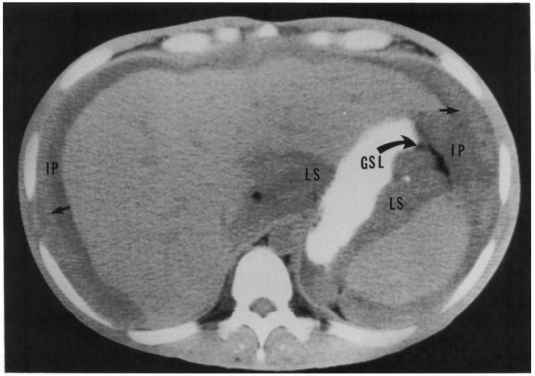 Protease inhibitors (saquinavir, ritonavir, indinavir, nelfinavir) prevent this step, interrupting the viral life cycle. 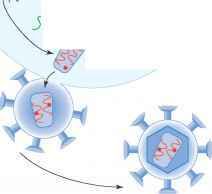 (4) After all components are present in the cell, HIV particles assemble and bud from the cell. Adapted from Stine, 1997.